Light, sweet and floral, Mengding Ganlu tea is the most poetic of Chinese green tea. "Julian, I am sorry for my previous arrogance. I was silly enough to think that nothing comes close to my Tribute Dragon Well tea. But this tea I have just tasted - it is really good, so amazingly sweet and refreshing." This tea was none other than the highest grade tea from the Meng Mountain - Ganlu tea - which means Sweet Dew. Her name concealed the reasons for her special quality. Few people know this, but there are three reasons for her name: Mengding Ganlu. According to several historical annals, the origin of Mengding tea can be traced back to a monk called Ganlu Puhui in 50 B.C., who was said to grow seven tea plants in the Mountain. The tea plants produced only a tiny quantity of leaves each year, but were famous for being able to cure every illness. For more than 1,000 years from Tang to Qing dynasty, she achieved an impossible record. Every year, she was chosen as one of the tribute teas for the emperor's consumption. "Yesterday she was in the Imperial Palace, today she is with us common people!" The word Ganlu means Sweet Dew. Who can forget the mesmerizing sweet flavors of hers? They are the culmination of two things: stringent harvesting and highly complex handcrafting process. One bud with one adjacent leaf covered by downy white hairs: You can see this with our AAA grade. Three-stage rolling: Most green teas by applying high heat (to halt the oxidation process) and rolling. For the Ganlu tea, this process is repeated three times. Her special qualities explains why she is the beverage of choice for Chinese Foreign Embassy during important country functions. Pure water of Yangze River. 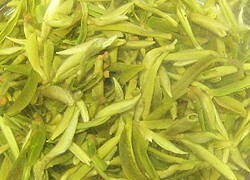 Tea leaves of Mengding Mountain. 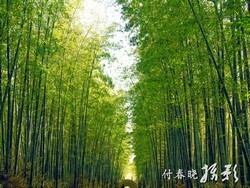 In two lines, it captures the locations of two tea paradises: Zhongleng Spring (中泠泉) and Meng Mountain. Zhongleng Spring has the tastiest spring water in China. Meng Mountain has so many fine teas, of which the Ganlu is the crown jewel. 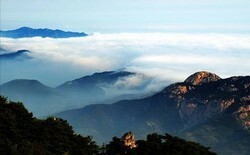 With an altitude of 1,450 meters, the west side of Meng Mountain borders the Tibetan Plateau. It is here that the Mengding Ganlu tea grows. Local climate is very misty, and the County of Yaan is popularly known as the "Rain City". An AAAA graded tourist area, the Mountain is the winners of many awards. A reputed Oxygen Warehouse, the mountain is 90% forested. A 1999 study determined that she contains the highest concentration of negative oxygen ions of the entire China. 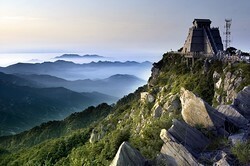 The Mountain is also dotted with countless waterfalls, highly enriched spring water, reservoirs and temples. To your right you can see a picture of this AAA grade, coming from the first harvest of Meng Mountain. 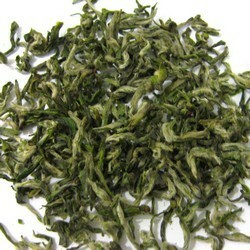 In term of look and taste, she reminded me greatly of Biluochun tea with her very fine tea buds. Due to the large surface area, the best result is achieved by steeping in medium temperature water for 5 minutes or more. She is light, sweet and floral, a bit like mountain dew. And when I get it right - a wonderful long aftertaste. This is probably the only tea I would drink in the evening. Soothing and refreshing, she would lift my spirit and brighten my eyes after a long hard day's in the office. Mengding tea. Essence of the clouds. Sleeping devils gone. Energy and concentration. Coolness in the bones. Wings to the heaven. I think I perfected Mengding Ganlu brewing 100 cc of filtered tap water to 400 cc of boiling water, add to a thimbleful of leaves, then another 1/4 ratio of 500 cc water. I get a perfect pot everytime, no more fish cooked with rubber tire smell due to too much tea leaves. I am glad, as I cannot afford future expensive tea purchases, Mengding Ganlu is much more affordable. My cup is the one I use for measuring, it has measuring lines and is tempered - it is a 2 cup capacity Pyrex mixing cup. My teapot is a Primula 4 cup (thank Amazon for the research material), future one will be a Bodum Assam 4 cup. Silver Needle is also way more palatable, now that I started with only a small amount of tea. Dragon Well is still best with a small amount of tea in a small amount of water. I think I have tried all of your green teas. My two favorites are Mending Ganlu and Biluochun. The 2013 teas are the best I have had. With the Mending Ganlu, I find that the water temp (70 degrees) and the proper steeping time are crucial. When brewed correctly it is beyond perfect. I will continue to order this tea. Personally I prefer only one brew. I have tried more but find the taste quite degraded. t I brew my Mending Ganlu with filtered water only, and that I do not drink it immediately, but let it cool for about a minute. Then I sip it slowly, savoring each mouthful. As far as the Mending Ganlu is concerned it is at least a 5 since that is the highest your rating system has. From a scale of 1 to 5 this year Mending Ganlu deserves a 6 ! Last year this tea was OK but this year is EXCEPTIONAL ! The sweet taste and the lingering aroma last more than ever after each sip. I can get three infusions from this tea and the first two are indeed amazing ! Every day was a good calm relaxed and in control day just because I had my tasty Mengding tea in the morning. I say was because I have no more Mengding tea and Julian is out of stock also ! I can't wait to buy more, but in the meantime I have also other types of tea from Julian that waits for me to enjoy them. Thanks Julian for providing really good quality tea in my life. We love the tea! Your Mengding Ganlu is of very good quality and value for money. We know that because we have high expectations and are spoilt for good tea! We have tried many different tea (green tea, oolong tea, and pu'er tea) and bought tea from China and Singapore; whenever we get to visit these places. We have ordered more Mengding Ganlu which we are going to share with our friends here. Hopefully, they will like it too. In the future, we hope to try your Dragon Well tea which has been our favourite. Right now, we are just going to enjoy the one we have bought! I've been enjoying the tea very much. I asked my co-worker if she wanted to stay for a cup of tea and she did. I made us a pot of the Mengding Ganlu tea. Both of us were simply amazed with it's beautiful aroma sweet taste. My co-worker who has never tasted this quality of tea was taken aback with the experience and so was I. It's incredible how a great cup of tea can make a difficult day better and a good day even more so. Thank you so much for making this wonderful tea available. I will look to you as my primary source for tea from now on. Amongst all the teas I sell, Mengding Ganlu performs best in low temperature. It is hard to understand why. The Biluochun tea has even finer tea buds! All I can think of is that she has a very light body and just needed to be treated be more care! Boiling water would not cause bitterness, but can result in greater astringency. You are also less likely to get the floral aroma and long aftertaste. Brew her the same way as Biluochun tea using hot water of 160 Fahrenheit (70 degree Celsius) and dropping the tea buds into the water. She comes best with low temparature and long infusions. For further information, read Biluochun Tea (Piluochun).